6/06/08 to 6/20/08 – Cutting: The fabric that I bought was cut in two pieces (ty, WalMart). I didn’t know until I went to cut it that it was two different variations of a fabric pattern that someone was nice enough to put on the same roll. My Saturday morning was spent on basic math to figure out how to piece 4.5 yards of fabric A to 2.5 yards of fabric B over 6 even panels. Seems easy, but it really did take the whole morning. After the frustration subsided, I cut fabric B into 6 panels of 15″ each. Then, I cut fabric A into 6 panels of 27″ each. I stitched the panels together and finished the seams with the hope of stitching a wide enough trim over the seam to merge the fabric pattern. Following the fiasco of fabric preparation, bodice construction went pretty well. I probably should have centered the pattern, but I was still fuming and lost my sense of planning. I don’t know how I feel about Rigilene, but it seems to be okay. Since I’m wearing the gown over a corset, I was a little afraid of canvas interlining with the coming summer heat, but I wanted to keep the bodice stiff. I decided on eyelets over grommets because I always have trouble applying them. Lacking an awl, I used a kabob skewer. 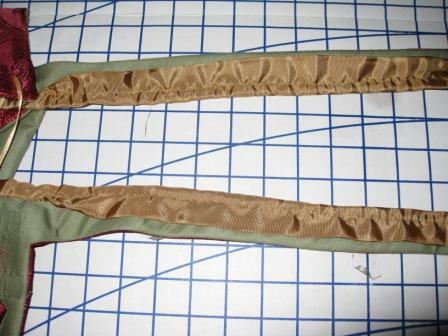 I found a thin bronze color in my ribbon stash, which fit the eyelets perfectly. I skipped the embellishments in the instructions for my own, then unplanned, trim options. I also skipped the sleeves since I’m not fond of the fitted style. I was intimidated by the shoulder rolls because I was afraid of them turning out lumpy and awkward. Then, the fabric nightmare resurfaced. Not only is does the dress fabric fray like nobody’s business, it doesn’t resist stitching much either. 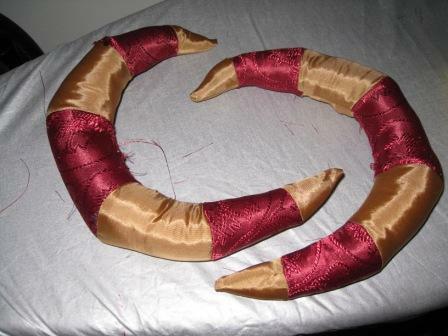 As soon as I started the stuffing process, I could see gaps between the burgundy and gold. Without panicking, I finished stuffing, slipstitched the rolls closed, and went to the fabric pile. The solution came in black velvet. I cut it into strips and handstitched them over the gaps. I really think it helped pull the colors together, and it gave me an idea for the next color in the scheme–black. 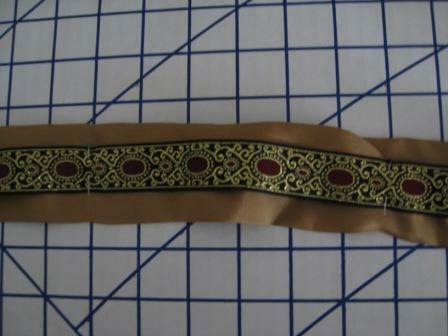 I found a burgundy, black, and metallic gold trim for a reasonable price at “ye olde” local JoAnn’s. I omitted the waist tabs, because I’m not fond of those either. Since I decided that sleeves were optional, I had to figure out how to finish the arm holes. Hello, gold taffeta. At this point I’d also decided to do a detachable paned sleeve, using ties, but that remains to be seen. After what I’d already gone through, skirt construction was almost fun. 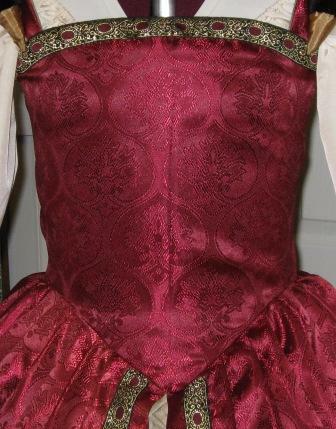 I had a little difficulty in attaching the pleated and gathered pieces to the bodice, but it turned out fine. On to trim. 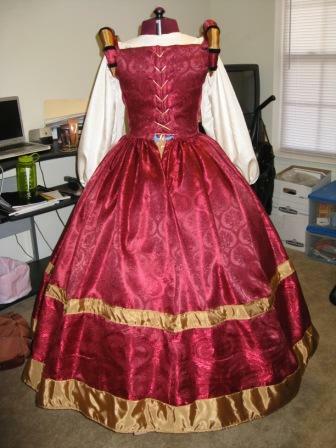 I’d picked out gold taffeta to break up the primarily black trim. I’d planned to lay the gold over the seams with the black on top, but I lost my nerve for reasons I can’t remember. Hemming the skirt was a mess because of the fraying fabric, so I decided to use the taffeta to clean it up along the bottom. Since I’m limited on the black trim, I planned to place it along the top of the bodice and along the seams on the front of the skirt. And then we moved…. Everything went into boxes and garment bags with the prospect of a bigger, dedicated sewing area. 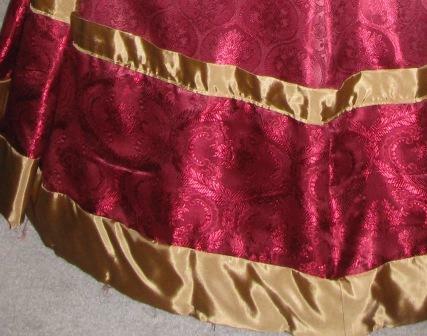 7/10/08 – Out of storing two weeks later, I finished the hem and started the underskirt. I’m stuck on having a detachable forepart, but I can’t quite figure it out. I suspect that I’ll just follow the instructions to avoid the aggravation since the faire opens in one month. 7/16/08 – Since this project has been in the works for so long, I decided to forgo the detachable forepart. Instead, I just didn’t finish the seams between the underskirt panels and the forepart. 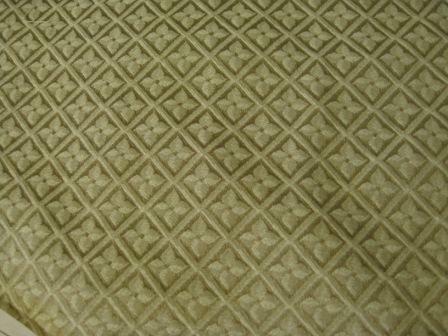 I have to say that I don’t like the “clean-finish” described for this pattern. 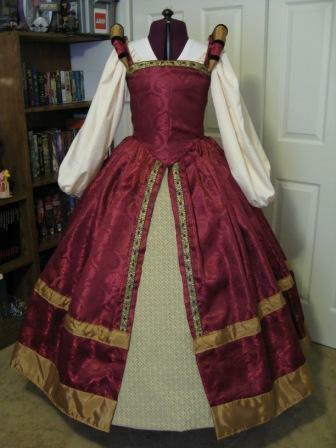 Maybe it’s just the fabric that I used, but the gown puckers and puffs at the seams. I acknowledge that visible machine stitching should be minimized in period pieces, but I can’t live with zig-zagged edges. 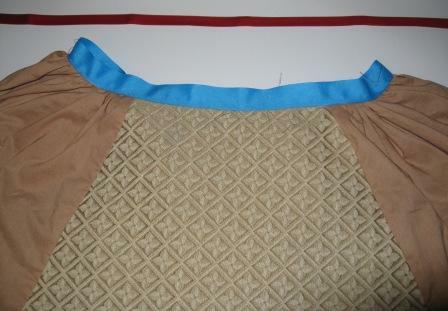 I left the outer skirt as is, but I decided to stitch each seam closed for the underskirt. The waistband “color of the day” was a peppy azure (see my farthingale diary). The bias tape on the inside is burgundy. One day, I’ll shop for matching waistbands in my projects, but not any time soon. 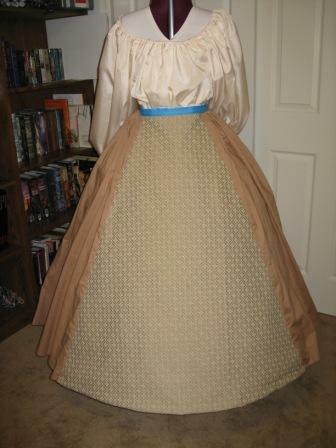 I’m thinking that the next under skirt will need to be a different fabric, as the cotton underskirt over the cotton farthingale doesn’t move well. In order to avoid issues with the neighbors, I reserved hand-stitching for the evenings. I hand stitched the black trim, but machine stitched the hems to keep my sanity and to get this done in this lifetime. 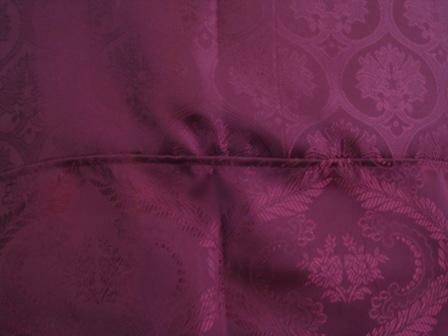 Slip stitching the hem on the gown would have been a nightmare, again, because of the fabric’s fray quotient. I also considered fusible web, but the fabric melts if I even think about using the iron on it. At this point, I’m marking the project DONE. I still need to find a solution for the awful fraying at the inside of the gown’s hemline. There isn’t enough room to fold it and hem again, and the zig-zag finishing did nothing. I’m probably going to snip the current fraying and sew twill tape or ribbon along the inside. I decided not to do a bum roll on the first pass. Having a bum, I don’t like the idea of accentuating it, and I feel that the skirts are bunched enough as it is. I hear that a roll can positively shift the weight of the skirts, while giving the proper silhouette, but I won’t be sold until I wear the gown for a while. 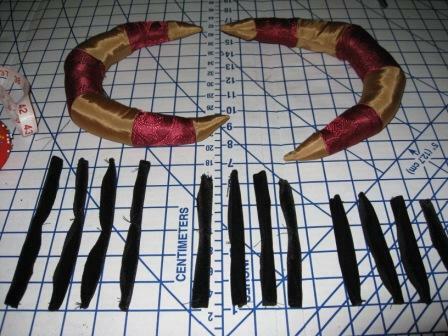 As I get started on accessories, I’ll need to work on the forepart’s matching sleeves. I’m shooting for detachable, paned sleeves. I’m waiting for my Margo Anderson set of patterns to get to work on the sleeves and a hat. I would also like to try my hand at button jewelry, since I don’t have any period pieces yet. 7/19/08 to 8/08/08 – Accessories and finishing touches went well, as in, I’ve worn them. The only thing undone are the sleeves, but they weren’t necessary for opening day, and are only awaiting points for the finish. 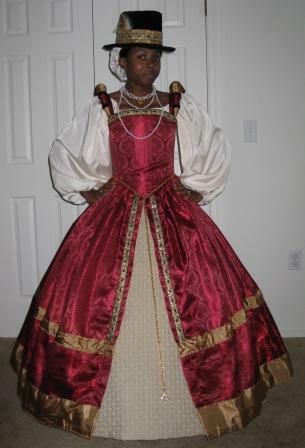 I’ll also have to sew the eyelets into the gown. The tall hat was a nightmare. The local chain fabric/craft store (…) did not have plastic canvas by the yard, so I bought it in standard sheets and joined them with duct tape. Adding to the fun, the local chain fabric/craft store (…) did not have millinery wire, so I used left over floral wire and joined the pieces with duct tape. The directions were fairly simple, but I had to take the hat apart because the plastic canvas cutting instructions were not included, so I just cut it according to the fabric instructions. I consulted the pattern maker’s forum for assistance, which saved me. Once I realized that the brim was too big–mind you, this is after all of the velvet had been sewn on, I had to rip all of the stitches and duct tape, cut it down about an inch, and put it back together. Once it was put back together, I realized that the top oval didn’t line up with the crown because the side piece had shifted during construction. It’s noticeably crooked. Rather than throwing a fit, I just put in the lining and went on my way. 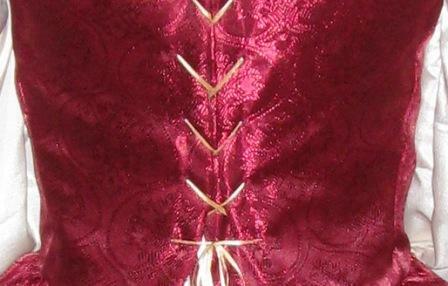 I took a break from upper class accessories construction to work on my peasant bodice. Upon my return to the hat nightmare, I made a simple hat band that matches my gown. 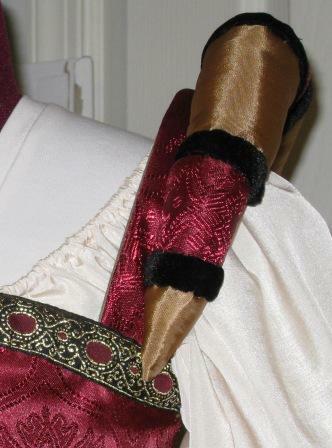 It uses the trim and taffeta from the gown in addition to a feather pad, which looks quite complimentary. Jewelry is always one of those “let’s try it and see” adventures for me. I’ve never taken a jewelry class, and I could probably do well to learn some of the basic techniques. This run through, I made a close-fitting pearl necklace (not quite a choker), a string of pearls for draping, a chain girdle with a simple pendant (actually, it’s a cell phone antenna charm), and a hand full of button rings. I love my bucket-o-buttons. I used them for the intended’s Marc Antony belt last Halloween, and they’ve served me well ever since. I’d been looking for a crocheted snood pattern for quite some time now, but I’m not that good at crochet, and found out that it’s not period. That part doesn’t really bother me because I’m not quite at a point to worry about being h/a, but I still couldn’t find a pattern that I could follow. I’d pretty much decided to just pin my hair up for opening day and buy a snood upon arrival. However, since I never do things the easy way, I decided to make a caul instead. This pattern (MA) turned out to be the simplest, most enjoyable thing I’ve made for this ensemble. The pieces consist of a band and a sack/net. The fun part is being creative with the embellishment–the result was simple, and, in my opinion, beautiful. Using the same material as my chemise, I laid the circle on the cutting board grid. I copied the grid (the fabric is very thin) in two inch blocks with black embroidery floss. At every intersection, I knotted black thread and clipped the ends at about 4/8 inch to give it a fun, turned out look. I attached a comb to the inside to finish. Once I figured out how to get my hair into it (seems simple, right? ), I was overjoyed. 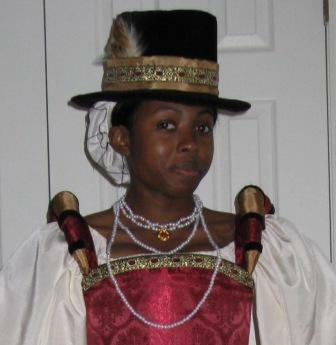 My hair is heavy enough to let the caul hang nicely, and with the ensemble, the light color breaks up the darkness between the gown and the hat. I fixed the hem issue with the gown by attaching a length of hideous cheer ribbon to the inside with fusible web. Since the gown will never see a washing machine, it works. My concern of the gold stars being seen (seriously…it’s like a Christmas bow on the hemline) came up every time the wind blew in my direction. 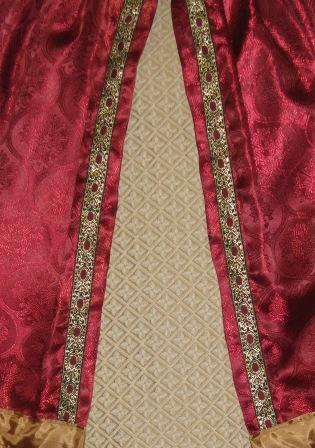 The hem stayed in, but I plan to sew a lining to the front few inches of the gown as soon as I get a free moment. I don’t want to pin the dress down because I like the way it swings. I’ll post the sleeve pictures as soon as they’re done–I need to find aiglets and pick up more twill tape for the points. UPDATE 10/13/08: Faux pearls have been sewn to the front of the bodice for a little extra decoration. A blackworked partlet may be coming. UPDATE 9/19/09: Here is the gown with pearls, no partlet yet. I’ll be adding gems to the bottom section of the skirt. After watching the queen’s skirt sparkle at sunset, I’m convinced that it’ll be a good update. I need to repair the boned sections, because the rigilene has started coming through in the back and center. The straps are also still too long, and with the bodice being too long as well, the shoulder rolls are distracting, waving at passers-by in the wind. I hate the fabric from Wal-Mart and most of the fabric from Jo-Anns. The only place I can got to see good fabric in person and decide what I like is Manhattan. Let’s take a trip this summer. There’s a whole warehouse that sells nothing but ribbons. Martha Stewart goes there. That’s good enough for me. 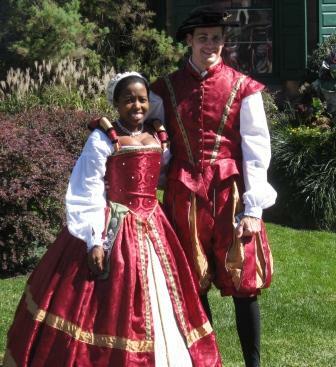 I was researching this pattern to make my first court dress (making the leap from peasantry! eek!). Thank you for a lovely write-up, and congratulations on THAT STUNNING DRESS! 😀 You and your guy look absolutely fantastic.